Skamania County derives its name from the Chinookan word for "swift water," a reference to the Columbia River. As of 2017, the estimated population was 11,837. The county seat is at Stevenson, which is also the county's largest city, although the Carson River Valley CDP is more populous. 90% of Skamania is forested and 80% is a part of Gifford Pinchot National Forest. There are many hiking trails throughout the National Park, the Columbia River Gorge and the Mount St. Helens National Volcanic Monument. The Pacific Crest Trail passes through Skamania County. 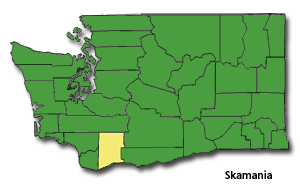 Skamania County was created on March 9, 1854, one year after the establishment of the Territory of Washington. Bordered on the South by the Columbia River, the County encompasses over 1600 square miles in the heart of the Cascade Range. Skamania County prides itself on the diverse recreational opportunities available from the Columbia River and throughout the Cascades. The County is rich in heritage and history and provides wonderful opportunities for residents and visitors. According to the U.S. Census Bureau, the county has a total area of 1,684 square miles, of which, 1,656 square miles of it is land and 27 square miles of it (1.63%) is water. The population density is 5 per square mile. 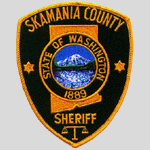 The Skamania County Sheriff’s Office is charged with meeting the diverse public safety needs of over 10,000 residents and millions of visitors. The Sheriff maintains the County Jail, is responsible for the investigation of crimes against persons and property, Search and Rescue, civil processes, operation of a cooperative, county-wide radio 911 center and provides proactive patrol services throughout the County. Meeting these needs is Sheriff Dave Brown and the 46 team members at the Skamania County Sheriff’s Office. 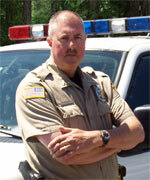 The Sheriff’s Office proudly serves the public safety needs of the citizens and visitors of Skamania County.